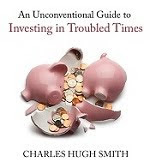 oftwominds-Charles Hugh Smith: What Is the Market Telling Us? The entire global economy now depends on this stripped-of-information "market" for its stability. But other than that, what else is the market telling us? Is it telling us anything about the real-world economy and the open market for equities based in that real-world economy? Before we can answer "what is the market telling us?" we must first ask, "what can the market tell us?" That is, what is the current market capable of communicating? This is the key question, for as we all know central banks have intervened in the market in an unprecedented fashion for over eight years. Central banks have transformed stock markets into signaling devices that are intended to boost the perception of increasing wealth, whether earnings and productivity are actually increasing or not. The idea is to generate a "wealth effect" that encourages people to borrow and spend more as they feel their wealth is increasing. This "wealth effect" borrowing and spending will (so goes the assumption) overcome the stagnation of wages and spending, and spark a gloriously self-reinforcing consumer credit-spending binge. This is considerably different from an open market of decentralized buyers and sellers, which reflects statistical data and sentiment regarding the real-world economy of sales, profits and productivity. Traditionally speaking, the stock market is a discounting mechanism, that is, the market absorbs data about the present and projects that into the future. If growth appears to be slowing, the market discounts future earnings and stock valuations decline accordingly. If growth appears to be picking up, the market increases its expectations of earnings and valuations expand accordingly. But even though global growth is visibly slowing, stock markets keep going up. There are several dynamics in play. One is that human players now account for no more than about 10% of market activity; the rest is robots and ETF (exchange traded funds) buying and selling. Another is that central banks have been major buyers of ETFs and stocks, and this is unprecedented. The Swiss Central Bank is now a major shareholder of Apple and Amazon, and the Bank of Japan owns a significant chunk of Japanese ETFs. This has created a disconnect between the market and the real economy, a gulf that widens daily. Can it continue? Yes, as long as central banks keep buying stocks and increasing liquidity. But there is a cost to this manipulation: there is little information left in the market other than the enthusiasm of central banks to push valuations higher and suppress volatility. This lack of reality-based information and the homogenizing of sentiment leaves traders and owners alike with a false sense of confidence, and sets up a Titanic Mindset: hey, we can maintain full speed through this dangerous ice field in a flat-calm sea because this ship is unsinkable: the "experts" told me so. What can a crummy little iceberg do to an unsinkable ship other than inconvenience the passengers? That's a risk we'll take. The entire global economy now depends on this stripped-of-information "market" for its stability. It's difficult to see this as healthy or sustainable. Thank you, Keisha M. ($50), for your stupendously generous contribution to this site -- I am greatly honored by your support and readership. Thank you, Nancy D. ($5/month), for your magnificently generous pledge to this site -- I am greatly honored by your support and readership.